Depth profiles for dissolved and suspended particulate TEIs were obtained using the NIOZ Ultra Clean sampling system. A box-shaped titanium CTD frame with 24 Ultraclean PRISTINE 27 litre water samplers with butterfly lids and Teflon valves. To avoid contamination the frame of the UCC- system is made of titanium and all the electronic pressure housing and other parts are made of titanium or clean plastics like Teflon, PETP or POM. The data arrived at BODC as 89 ASCII files split into two cruises PE319 (18 standard CTD casts and 22 trace metal CTD casts) and PE321 (24 standard CTD casts and 25 trace metal CTD casts) representing all of the CTD casts taken during these two cruise. Data were reformatted to BODC internal QXF format (subset of NETcdf). The following table shows how the variables within the ASCII files were mapped to the appropriate BODC parameter codes. The main objective of the RV Pelagia cruises PE319 and PE321 (GEOTRACES cruise A02 leg 1 and leg 2) was to carry out high resolution sampling of the Atlantic Ocean including deep section for trace metals (Fe, Al, Zn, Mn, Cd, Cu,Co, Ni, Ag) in conjunction with lower resolution sampling for Rare Earths, natural isotopes (234Th, 230Th, 231Pa, 223Ra, 224Ra, 226Ra, 228Ra, 227Ac) and anthropogenic isotopes (129I, 99Tc, 137Cs, 239,240Pu, 238Pu). Two CTD systems, both with large volume samplers were used throughout the two cruises (ultraclean all-titanium trace metal clean CTD and a 25L stainless steel CTD rosette). During the two cruises a total of 39 stations were sampled, 17 stations during PE319 and 22 stations during leg 2 PE321. Stations were split up into three types; normal stations, superstations and hyperstations. Normal stations typically consisted of 1 CTD 25L and 1 UC CTD to the bottom. Superstations were defined by the additional use of in situ pumps and the sampling of Pa/Th. Hyperstations consisted typically of 2 x CTD 25 L to the bottom, 2 x UC CTD to the bottom, 1 shallow (~500 m) CTD 25L cast and the use of the in situ pumps. The Clean CTD frame was parked and 'seasave' secured inside the clean air container. Prior to a cast the frame was prepared inside that container and transported to the CTD-launching spot using a custom made aluminium pallet and an extra long forklift. After each clean CTD cast the frame was returned to the clear air container within minutes avoiding contamination of the equipment with grease, rust or smoke particles from the ship. After closing of the container the air treatment system was started to clean the air using HEPA-filters and the frame, bottles and electronics were rinsed with fresh water. All CTD data was processed using Seasave V7.20 and SBE Data Processing V7.20. 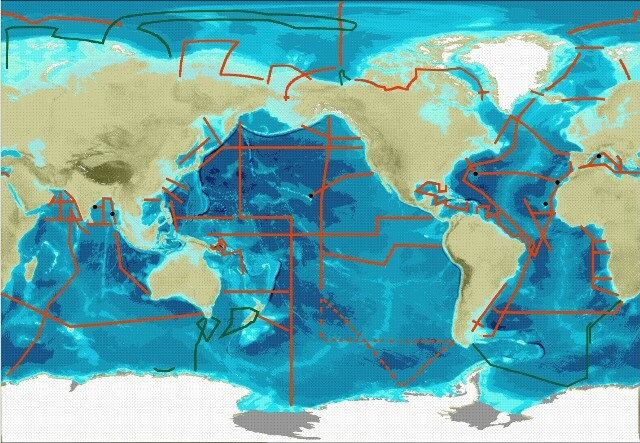 The CTD data were recorded with a frequency of 24 data cycles per second. A bottle file was produced from the up cast for each CTD. The raw CTD data were processed and reduced to ASCII files, giving 1 dbar values. Full data processing was completed at NIOZ, Texel using WOCE guidelines. Discrete salinity and oxygen samples were collected to calibrate the CTD sensor data, all calibrations were performed by NIOZ.